An angelgotchi is the next generation of Tamagotchis, sometimes it is also refered to as the Tamagotchi angel. 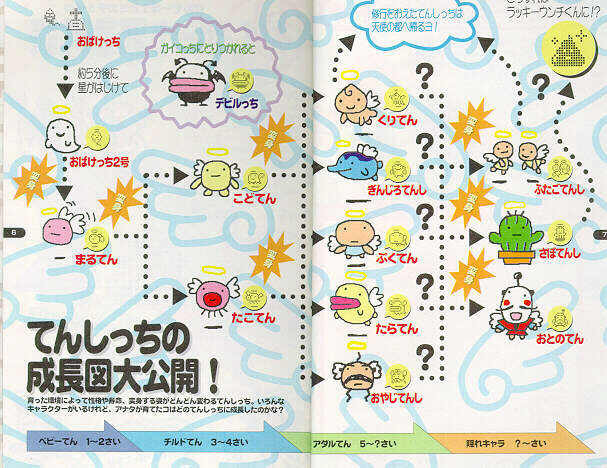 The angelgotchi is very different from the Tamagotchi, it starts of as an angelgotchi going home then after 5 minutes it changes into a baby ange. Feed You feed it Pie or Chocolate, sometimes when you give it chocolate a bat comes down and tries to steal the chocolate, you must tap the case to scare the bat off or the happiness meter will go down. Stroll When it is an adult a door sometimes appears by the angel, you select praise to send your angel out and then tap it to call it back. Sometimes when it comes back it may look different.